The AOC Agon AG353UCG provides the next high-end specs enthusiast gamers will love such as a higher than before refresh rate and G-Sync HDR. This new type of ultrawide gaming displays has been delayed for several months now, but it looks like it will finally release this year. The AOC Agon AG353UCG is one of the few models to evolve its unique category, so let’s take a peek at how it will push the envelop further. The AOC Agon AG353UCG inherits its looks from the AG273QCG which is one of the most attractive in the market right now. The new aesthetic treatment that set that monitor apart from its competitors even won the Red Dot Design Award in 2018 for its mix of elegance and edginess. What’s great about these new monitors is that they are bezel free on three sides, giving the user an undisturbed view of all the viewing real estate. We can say that the AOC Agon AG353UCG is one of the sleekest in its category and its depth is only due to the curvature of the screen. The rear panel of the product is mostly smooth with a flat black finish, but what stands out is the LED ring at the center. The brand calls this feature the AOC Light FX which is RGB-compatible so users can pick a shade that matches their builds or preference. The AOC Agon AG353UCG includes all the familiar extras we love on gaming monitors such as the pop-out headset hanger which is now available on both sides of the cabinet. It’s also fantastic that you don’t have to deal with buttons since there is a joystick for easy navigation of the OSD. We wish AOC will still include a hotkey remote in the package for switching between presets on the fly. The large cabinet of the AOC Agon AG353UCG is supported by a metal stand with a red, Y-shaped base that looks exquisitely thin. Initial specifications suggest that you can tilt, swivel, and adjust the height of the monitor, but pivoting isn’t available since its useless. Of course, you can switch to a standard VESA monitor arm or mount if you need more flexibility. The AOC Agon AG353UCG includes a second-generation G-Sync HDR FPGA module with its control board, so it has an updated I/O panel. It’s still limited in terms of options, but you get DisplayPort 1.4 and HDMI 2.0 instead of the usual along with four USB 3.1 slots. The video inputs have been updated to accommodate HDR signals and the higher bandwidth requirements of the refresh rate. The AOC Agon AG353UCG is then rounded up by more powerful 8-watt speakers which should be better for movies and music. However, we know many will still prefer the immersive capabilities of headsets to match this model’s gorgeous screen. 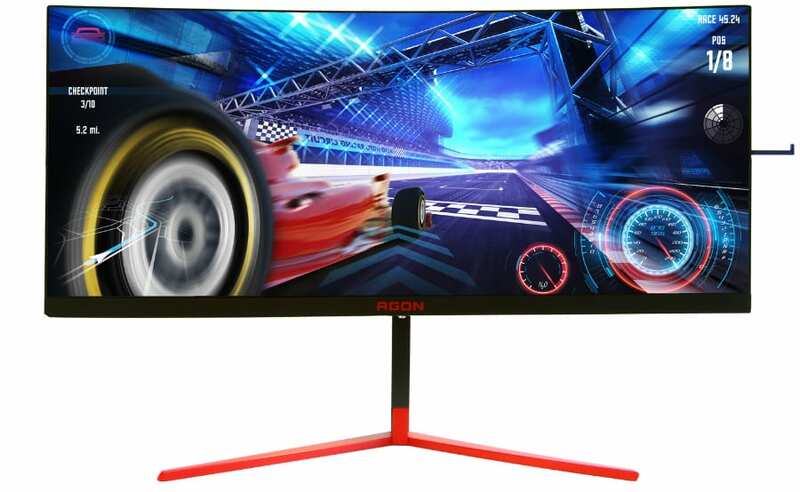 The AOC Agon AG353UCG boasts a 35-inch curved VA panel with a 3440 x 1440 resolution, 200Hz refresh rate, and a 4ms response time. AOC mentioned a 1ms MPRT feature for this model which is valuable for VA monitors who are known to have slower GTG response times. A contrast ratio of 2000:1 is specified along with a 1000 cd/m2 peak backlight. The AOC Agon AG353UCG is VESA DisplayHDR 1000 certified, meaning it has full HDR capabilities like the Asus PG27UQ. We can expect comprehensive gamut coverages with the help of Quantum Dot coating and the monitor’s 512-zone Full Array Local Dimming (FALD) backlight. A more or less identical approach found on the PG27UQ yielded fantastic results in image qualities such as vibrancy and accuracy, so we aren’t expecting any less from this product. The 3440 x 1440 QHD resolution is well-suited for a monitor of this size which his comparable to a 27 or 28-inch display, but with more room on the sides. Ultrawides have been very popular in the market since they released due to the advantage of the peripheral views brings. The screen is more immersive without sacrificing sharpness and details, plus it gives your eyes more to appreciate from in-game environments or landscapes. Ultrawide monitors are also a great pick for watching anamorphic movies and productivity. The extra space is valuable for a professional who wants to streamline his or her work process by having more room to bring apps to the front of the display. If the AOC Agon AG353UCG’s panel proves to be very capable in the accuracy department, this will be one hell of an option for creators who want to game at an enthusiast level. The AOC Agon AG353UCG should support 10-bit color at 144Hz thanks to its DP 1.4 connectivity. Running at anything higher will drop the screen to 8-bit, but we reckon gamers will find it difficult to discern the difference. The Asus PG27UQ also does this, dropping to 4:2:2 chroma sub-sampling if set to its full 144Hz 4K output. 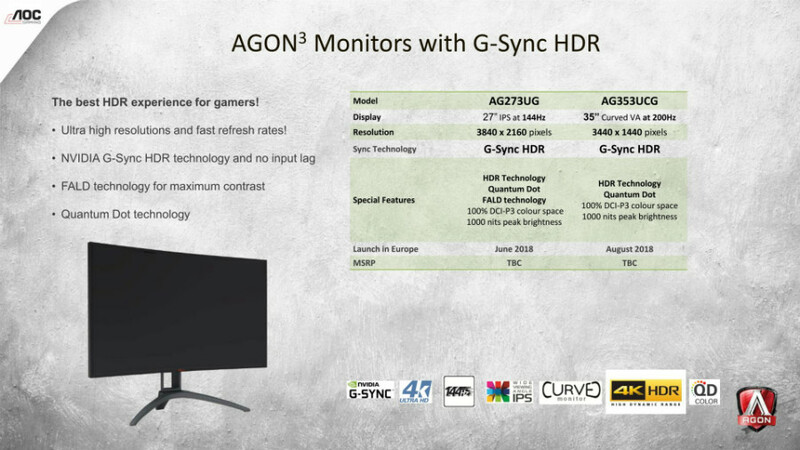 The AOC Agon AG353UCG is a G-Sync HDR monitor that includes the latest controller variant found in monitors like the Asus PG27UQ and the Acer X27. There are reports that these new models run hot, so manufacturers are installing cooling solutions on the cabinets. This isn’t confirmed at this time, but expect to see updates as we get closer to the release date. The AOC Agon AG353UCG should be a fantastic monitor in both gaming performance and image quality thanks to its top-end specs. We’ve seen superb qualities in monitors with similar implementations, so we are expecting the best from this model. We’ve seen many posts and rants about waiting for 200Hz QHD ultrawides to come out, and it looks like our questions will be answered soon. There is no final date for the AOC Agon AG353UCG’s release, but a rep from the brand suggested that we can expect this new offering by September or October of this year. Pricing is estimated to sit between $2000 to as much as $2500, but we know this will be more affordable than similar models from other brands. Do you know if this model uses Cadmium Free Quantum Dots from AUO? Hi, Eskers! Unfortunately, we have no way of knowing if AUO did use Cadmium or not in their latest panels. We will try our best to inquire about this for you. Thanks!